Technically, the market is likely to stop its upside correction. The prices may continue rising in the short term, but the bears will soon be there to weaken the bulls’ positions. Some cryptos are already kind of starting a new downside movement, although these attempts may soon prove unsuccessful. 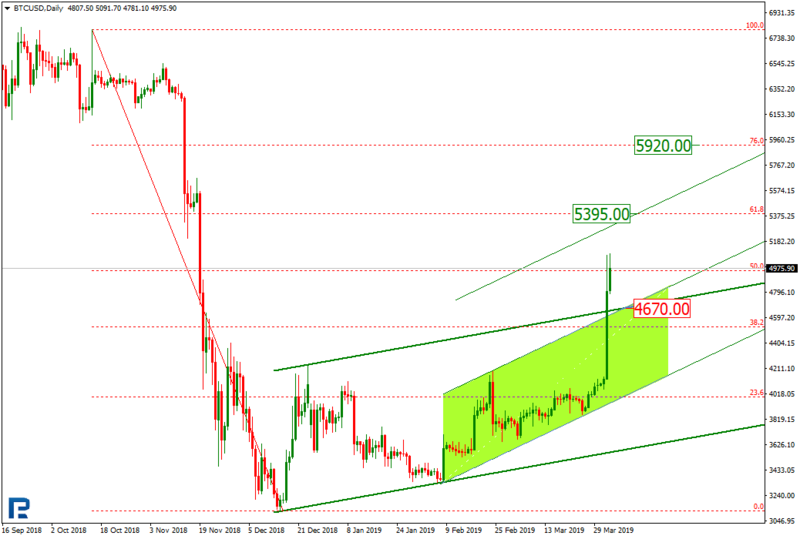 On D1, BTC reached 50% Fibo, while the short term ascending channel got broken out, and the price is now aiming at $5,395, or 61.80% Fibo. The major crypto may also rise to 76% Fibo, or $5,920, but this is very unlikely. The support is meanwhile at $4,670. On H1, BTC attempted to make a higher high and stay above. The price may continue rising to the resistance at $5,300, but the Stochastic is diverging, which signals a possible pullback that might take the price lower to 50% Fibo, or $4,675, which is also the current support. EOS is rising after the MACD convergence and the $1.55 bounce. 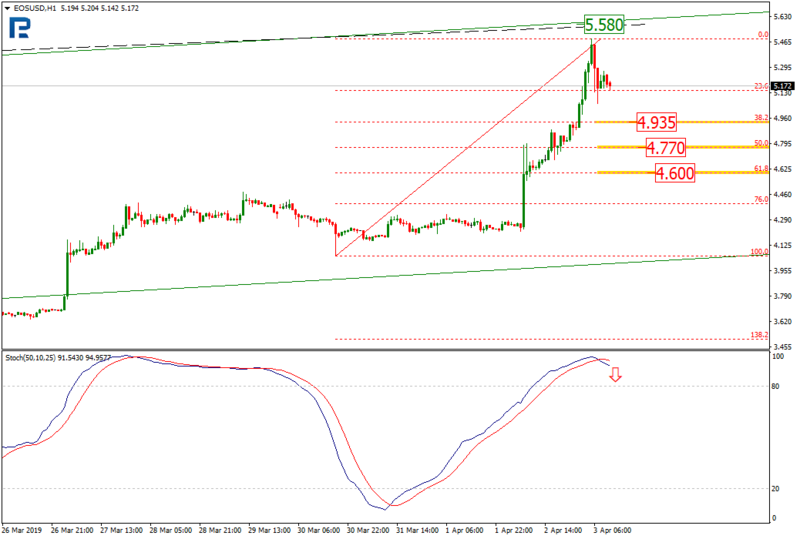 A stable trend is being formed, while the price is aimed at 23.60% Fibo, or $6.60. 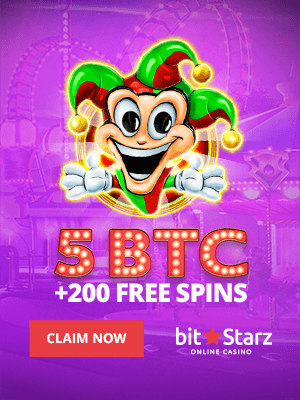 In case this target is reached, a new long term bullish trend may be born. 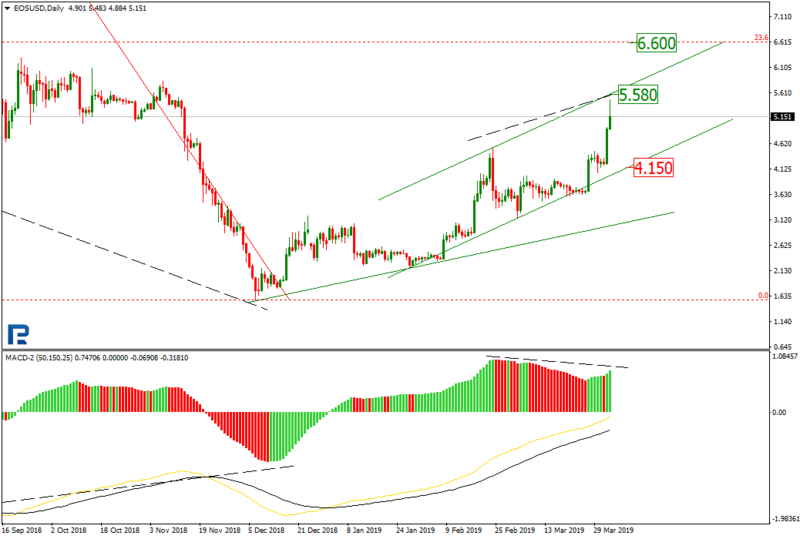 The short term target is meanwhile at $5.58, which is the current channel resistance, but the MACD is diverging, which means a pullback is near. Meanwhile, the support is at $4.15. On H1, thew price is quite near the resistance, while the Stochastic has formed a black cross in the overbought territory, signaling a correction. This pullback may send the crypto to 38.20% ($4.93), 50% ($4.77), and 61.80% ($4.60) Fibo. 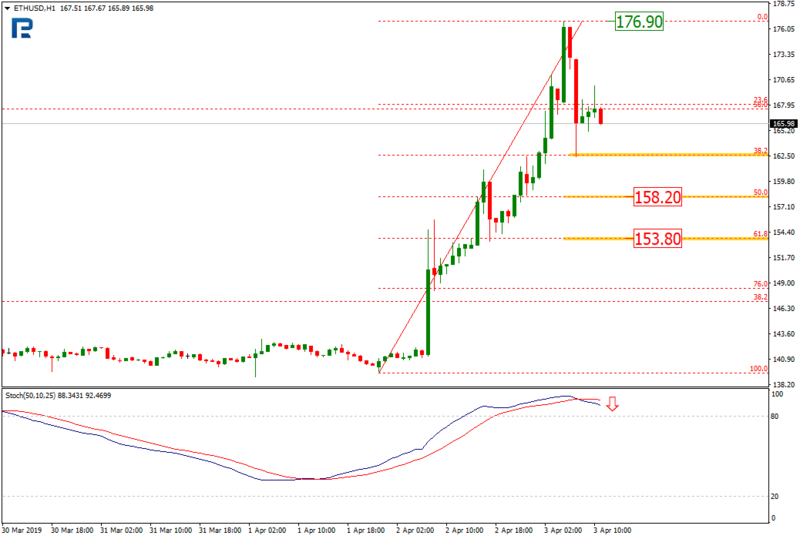 Eth is correcting upwards on D1, having already reached 50% Fibo and aiming at 61.80%, or $187.90. The price may rise to 76% Fibo, or $212.40, but a reversal after reaching the round number of $200 is much more likely. 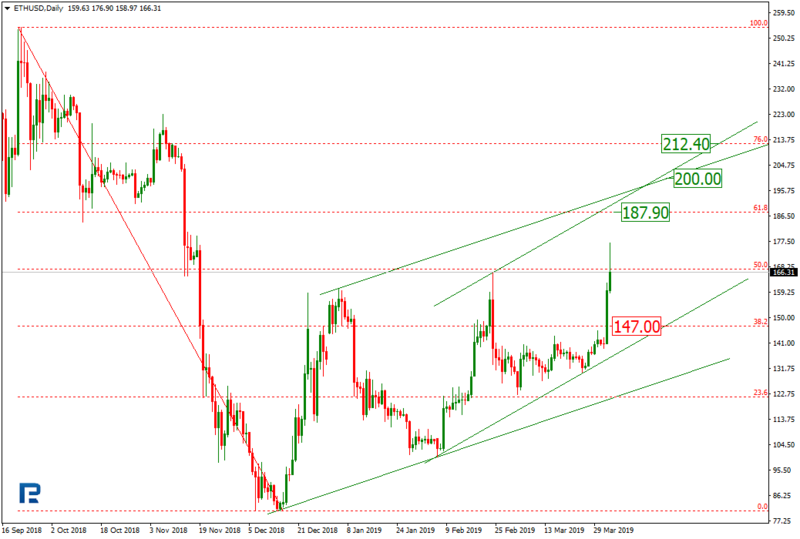 The support meanwhile may be found at $147. 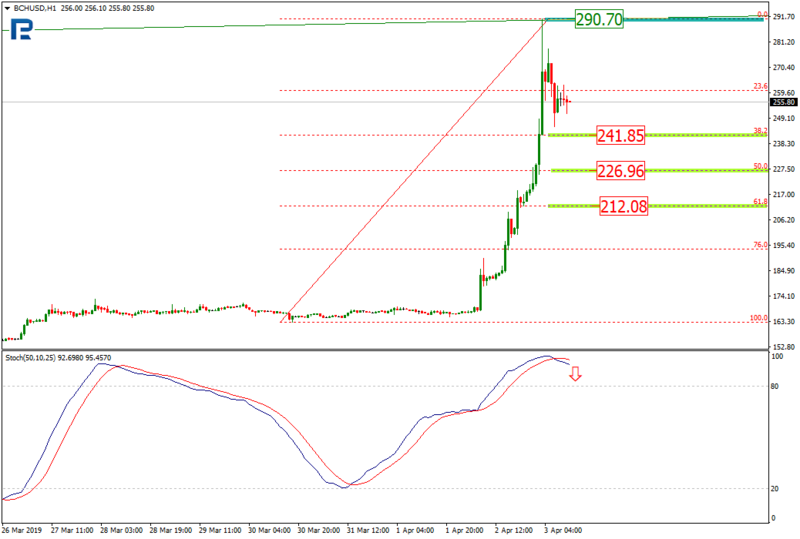 On H1, eth has reached 38.20% Fibo, with the pullback being supported by the Stochastic’s black cross in the overbought territory. The next targets are lying at 50%, or $158.20, and 61.80%, or $153.80. The resistance is meanwhile at the high of $176.90. LTC is rising heavily on D1, which looks as though the long term downtrend were losing its momentum and were going to reverse. However, this is just a mere correction, at least for now. 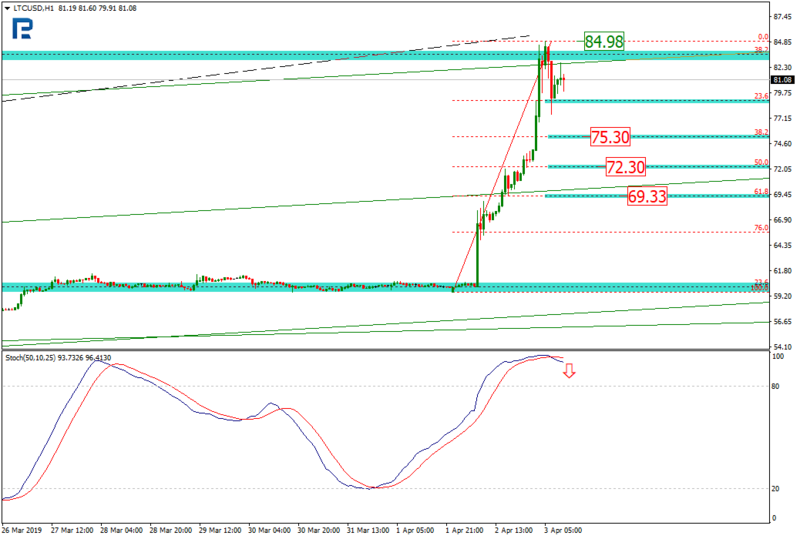 The price reached the projection resistance and 38.20% Fibo. The MACD supports the current correction, while still able to diverge, signaling a pullback. 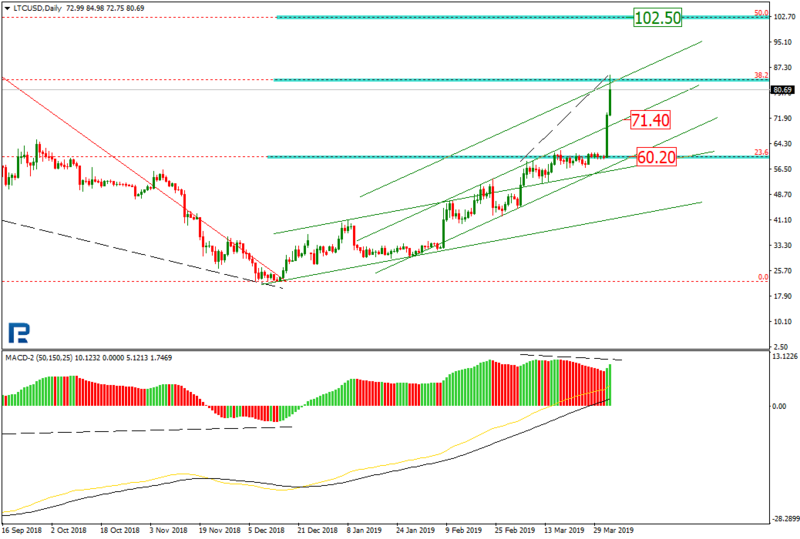 In case of such a pullback, the price may be sent to the local support at $71.20, with the major one being at $60.20. Still, a downside pullback may be followed with a rising move to 50% Fibo, or $102.50. On H1, Litecoin hit the resistance and then started pulling back, which got confirmed with the Stochastic’s black cross. 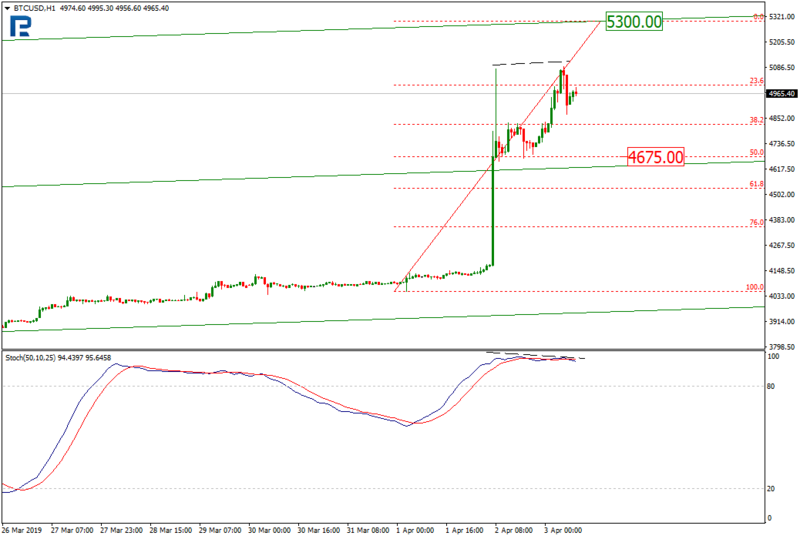 The target may lie at 38.20% ($75.30), 50% ($72.30), and 61.80% ($69.33), with the resistance at $84.98. 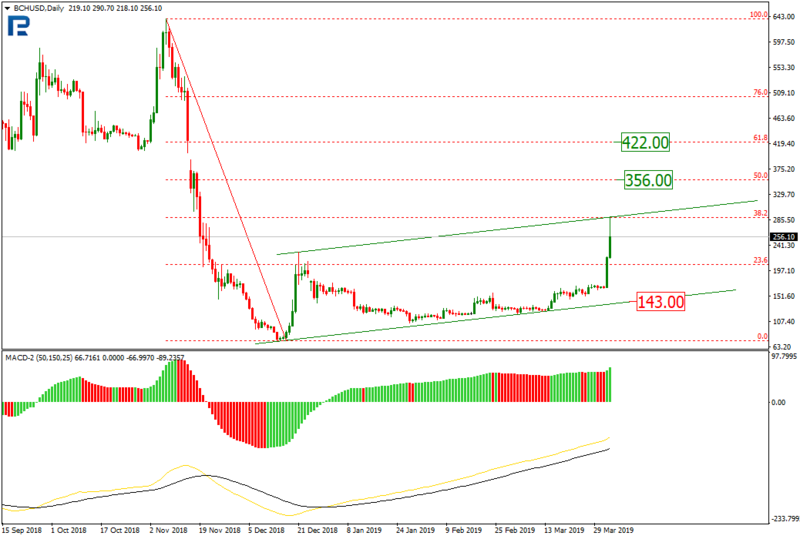 On D1, BCH reached the correction channel resistance and 38.20% Fibo, now ready to hit 50% ($356) and 61.80% ($422) in case of the resistance breakout. Conversely, if the price hits the support at $143, the crypto may make a few lower lows. The MACD, however, signals the uptrend is quite stable. On H1, BCH works in line with most other cryptos, heading down after hitting the resistance. The pullback reached 23.60% and may continue to 38.20% ($241.85), 50% ($226.96), and 61.80% (212.08). This is well confirmed with the Stochastic’s black cross.